A lot of people through popular science fiction television shows such as Star Trek have seen the effects of what teleportation can do. In the series, that popularized the term “Beam me up, Scotty” we see Captain Kirk, the main protagonist and character, at the flick of a button, seem to disintegrate and disappear, only to reappear at a different location altogether. While the idea of teleporting people or objects instantaneously still remains in the realm of science fiction, a group of Japanese scientists led by Masahiro Hotta have proposed a theory on how light or energy can be teleported over great distances by taking advantage of the entanglement effect in vacuums. What was thought to be science fiction is now increasingly becoming science fact? Imagine gaining the ability of being able to teleport energy over great distances without batting an eyelash. Would that ability make the world a better place or would it make people fight wars on who can control such power? That being said a group of researchers from Tohoku University in Japan has offered a new theory on how to teleport energy over great distances. The leader of the research team is Masahiro Hotta and together with his colleagues published a scientific paper in Physical Review A. In the study, the research team proposed a process of being able to harness the properties of squeezed light or vacuum states and in effect allow for energy to travel or teleport. Before we get too excited about simply pushing a button and voila reaching the office in a split second, what happens for real in the scientific world is not as romantic or melodramatic as what happens in science fiction TV. Scientists have begun using the term teleportation for the purpose of describing the results of what is called entanglement experiments. What happens here is that two entangled particles are connected somehow regardless of the absence of an existing connection between the two. There are changes that occur to one particle that also happen to the other on an automatic basis. Scientists have widened the scope of their experiments to also include not just matter and light but more importantly energy. Hotta and another team of scientists first tinkered with the idea back in 2008. They devised a theory for the teleportation of energy by using the properties of vacuum states. Their theory suggests that these vacuums are not truly empty but random particles actually pop in and out of existence through some form of entanglement. The theory somehow suggests that teleportation can only be achieved on short distances only. 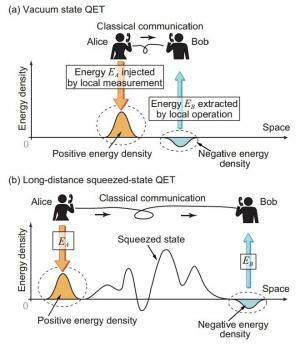 However, Hotta and his current team have discovered a way to widen the scope of teleportation distance through the use of a property that is known as squeezed light that is tied to a squeezed vacuum state. However, it is important to note that quantum mechanics limit the means by which values in a system like that of a vacuum can be measured. Scientists have discovered that increasing the uncertainty of one value results in lessening the uncertainty of the others. When applied to light, the more pairs that are traveling with one another through a vacuum, the more is the possibility of entanglement occurring and thus teleportation of energy over great distances is made possible.